The following clip sheds some light on the making of the instrumental track, “Let’s Go Away For Awhile.” I like this video because it gives a sense of both the exacting quality of Brian Wilson’s vision for this record—you hear about his already fully-formed ideas of the deep sound he wanted from the snare drum, his request for Roy Caton to “turn away” as he delivers the last trumpet note, etc.—but also shows how many supremely talented musicians were involved in bringing his vision to life. 25 musicians appear on this track alone! Here’s a nice picture of some of the musicians at work during the Pet Sounds sessions (bassist Carol Kaye sits in the foreground). 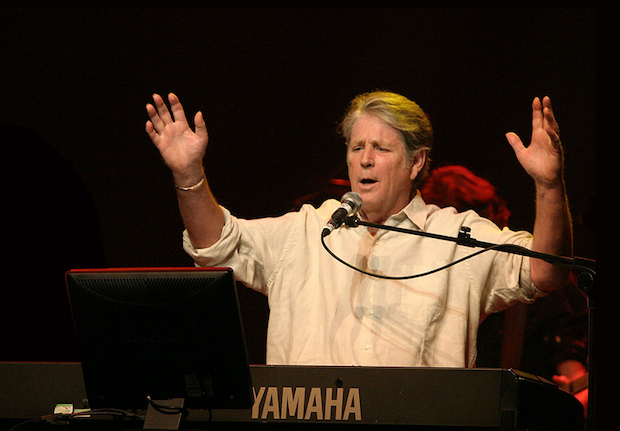 The Reverberation Appreciation Society commissioned Al Lover to curate and produce a tribute to Brian Wilson’s career keystone. The album will be released exclusively as a 180g 2xLP with gatefold packaging, limited to an edition of 2000. The album will be available at the Levitation festival starting April 29th, 2016, and available in stores with an official street date of May 27, 2016. 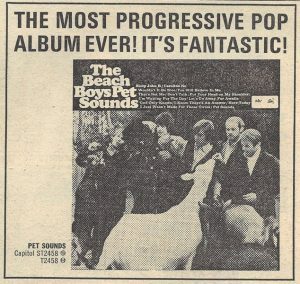 When Capitol Records initially released “Pet Sounds” in the UK the label ran adverts in the music press like the one you can see here. At the time there were some fans who were confused by The Beach Boys’ 11th studio album where were the stripped shirts and the surf -boards? In the intervening 50 years Pet Sounds has been acknowledged as a masterpiece, a record that has topped countless polls of the greatest albums ever made and is revered by musicians and fans as the pinnacle of Brian Wilson’s song writing, production and all round creative genius. Fifty years on it is to be reissued in all its glory with bonus material that will have many drooling with pleasure. The influence that Pet Sounds has had, began even before it’s release outside the USA. On Monday, 16th May, 1966, Bruce Johnston, who was then the newest Beach Boy, arrived at London’s Heathrow Airport carrying a copy Pet Sounds that had come out in the USA that very day – well in advance of its UK release. The following day, in his suite at the Waldorf Hotel, Bruce played Pet Sounds, in its entirety,for John Lennon and Paul McCartney – not once but twice. After the two Beatles left the Waldorf they went straight back to Paul’s house and there, inspired by Brian’s incredible music, they worked on the introduction to their song ‘Here, There and Everywhere’ that appeared on Revolver. Ironically, given the love and respect that exists around the world for this album, the 1966 US release failed to achieve the kind of success that had been anticipated or the level of sales achieved by the band’s earlier albums. Pet Sounds made No.10 in the US. In the UK it fared far better, making No.2 on the album charts, the most successful of the band’s albums to that point. The 50th anniversary release includes both Brian Wilson’s original mono mix and the later stereo remaster that captures the depth and perfection of Brian’s arrangements. The two ‘session’ CDs give us amazing insight into Brian’s control of the many musicians who play much of the music that underpins the sublime vocal harmonies of The Beach Boys. Pet Sounds features some of the greatest LA musicians of the period. There are guitarists as varied as, Glen Campbell, Barney Kessel, Tommy Tedesco and Al Casey. On keyboards there’s Larry Knetchel, drummers, Hal Blaine and Jim Gordon along with French Horns, violins, an electric Theremin, and all manner of percussion instruments, including Coca-Cola cans. Listening to Brian encouraging, demanding and cajoling the musicians on the session tapes is like a master class in record production. 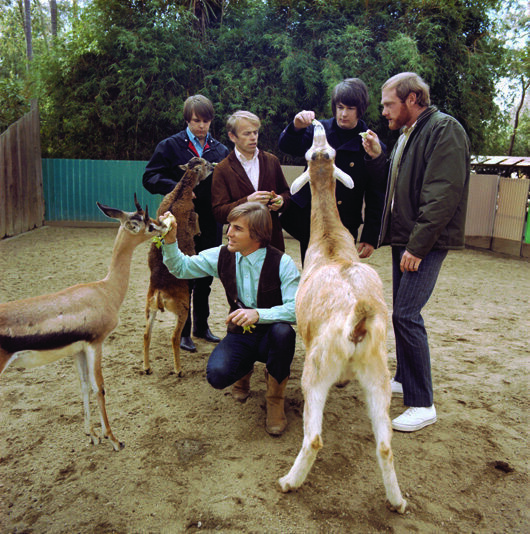 Following the release of the album, ‘Wouldn’t It Be Nice’, ‘Sloop John B’ and ‘God Only Knows’ all became staples of The Beach Boys live shows and in more recent times, both, Brian and The Beach Boys touring band have featured songs from the album in concert and versions of Pet Sounds’s tracks performed live feature on disc 4 all of these are previously unreleased. On ‘God Only Knows’ it is just Carl, Brian and Bruce that are singing and on the a capella version, when they finish their vocal, a voice asks, “How was that? Was that cool?” It’s Bruce Johnston asking the question and it is the perfect coda for not just the song, but also the album, because Pet Sounds is arguably the coolest record of all time. This is the kind of record that makes life worth living, reaffirming the notion that pop music is the most admired art form in the world. And make no mistake, Pet Sounds is art. 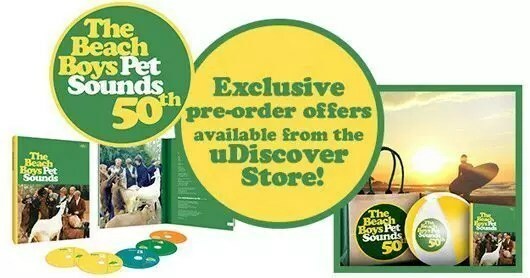 All editions of the 50th anniversary Pet Sounds will be released on 10th June and we have an exclusive offer in our store for the 4CD Super Deluxe Edition that includes a Beach Ball and Beach Bag, as well as an exclusive slip mat with the stereo and mono vinyl editions of the album. 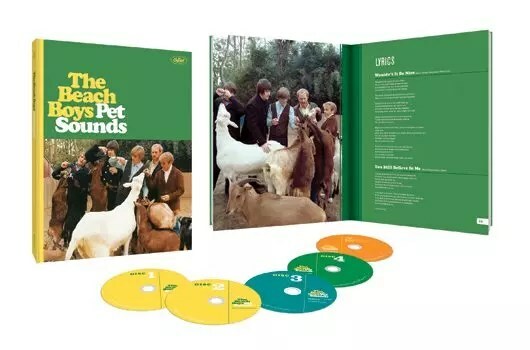 Pet Sounds (50th Anniversary Edition) will be available in several configurations, including a 4CD/Blu-ray Audio collectors edition presented in a hardbound book, featuring the remastered original album in stereo and mono, plus hi res stereo, mono, instrumental, and 5.1 surround mixes, session outtakes, alternate mixes, and previously unreleased live recordings; a 2CD and digital deluxe edition pairing the remastered album in stereo and mono with highlights from the collectors edition’s additional tracks; and remastered, 180-gram LP editions of the album in mono and stereo with faithfully replicated original artwork. 180-gram heavyweight black vinyl LP reissue of ‘Pet Sounds’ remastered in Mono. Includes download card for digital redemption of the audio. 180-gram heavyweight black vinyl LP reissue of ‘Pet Sounds’ remastered in Stereo. Includes download card for digital redemption of the audio. The late George Martin, seen here sitting behind the wheel of a vintage Cadillac convertible, cruising through the streets Los Angeles and talking about the city’s history as a studio town. In the clip, taken from the 1997 BBC documentary “The Rhythm of Life,” Martin’s got a destination in mind as he rolls down Sunset Boulevard and up into the Hollywood Hills towards Brian Wilson’s house. As he drives, Martin, whose work producing the Beatles changed the course of popular music, discusses the city. The scene cuts to the two in their natural habitat, a recording studio. They sit in front of a mixing board, the “God Only Knows” unmixed master playing in the background, and discuss the ways in which Wilson worked his magic. As the song plays, Wilson looks up at the ceiling, lost inside his brilliant creation while Martin plays with the mix, exploring the arrangements, techniques and tricks of Wilson’s trade. Martin adds a compliment — “It’s a lovely song and a beautiful record” — while making his own mix of “God Only Knows.” He slides vocal tracks up and down, mixes in percussion, explores the odd rhythmic accents. As Wilson looks on, listening to what Martin has just done to his song, the Beach Boy comes to a startled conclusion: “You know what? That’s a better mix than I had on the master. You’re making a better mix of this than I did on the master!” “Never,” says Martin with typical humility.